When you are having your drive or patio installed, you need to find local block paving companies that can carry out your required work. How do you find the best driveway companies in your area? 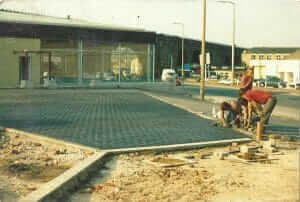 Are you looking for block paving companies and contractors? You can ask your friends and colleagues who they used. You can also use the search engines like Google for your enquiry. Do you know what to search for? Here are some suggestions of search terms you can put into Google to find companies, contractors or installers. This will bring up a lot of results for you to choose from. You will still have the dilemma of who you are going with. You need to contact at least three block paving companies or installers for quotes on your specific project. How long have they been laying block paving? Have they got jobs close by they have completed, that you can look at? What is their specification for laying the blocks? How deep are they going to excavate out from finished depth? What will they use underneath the paving blocks? What depth will the subbase be? Will the price include taking the waste materials away? How long will it take to complete your block paving job? Asking these questions should elevate most problems you could have by not asking them. Please don’t let just the price determine who you choose but go with a price that is somewhere in the middle if possible. Choose the block paving company that have answered your questions and you feel most comfortable with. If you are looking for good block paving companies please click Contact Us to arrange a free quotation.